Surprise, surprise! 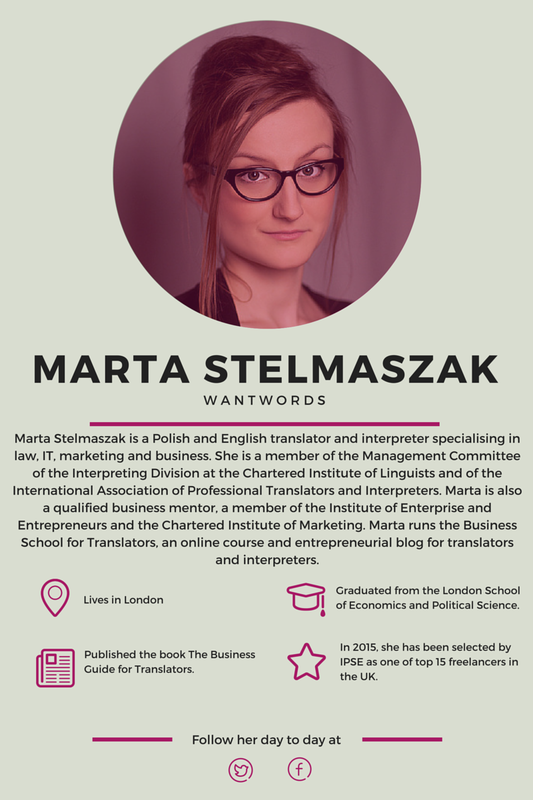 The first interviewee is Marta Stelmaszak. Some of you were indeed right on your guesses, so we probably share the same opinion. The reason I chose Marta is because she is one of my role models since my early days as a freelance translator, when I decided to dedicate part of my time to the internet as well, especially Twitter. I don’t remember how exactly I came across her, but she always inspired me, and still does. Her passion, professionalism and dedication to all her projects motivates and stimulates me to always be better and reach higher. So let’s hear from her! 1. You are an incredibly diverse woman, Marta! You are a translator; you give speeches all around the world; you run a blog, a YouTube channel and your other social media channels; you and Valeria Aliperta run The Freelance Box; you are the Business School for Translators course tutor; you have just written a book — just to name a few! Tell us more about what you do and how you first got started. I think you covered it quite well! Of course, I spend the most of my time translating and, more occasionally now, interpreting. Indeed, in the past few years I’ve been active on a variety of media, from my own YouTube channel (still out of my comfort zone) to publishing a book. It was all part of a plan to give back and pay forward. I’ve received some excellent advice throughout the years and I know I wouldn’t be where I am now without meeting and speaking to some of the most wonderful colleagues, often not in the limelight at all. However, diversity and multi-passion approach has its price. It took me time to realize that I have to focus and concentrate and this explains why 2015 is the last year where you’ll see plenty of me. Part of being a responsible business owner is to decide what’s best for you and your business at any given time. I’ve already planned my last conference presentation for a while, and decided to scale down on my blog. How did I get to this point? Since I first started, some 8 or 9 years ago, I’ve always been working at full pace, giving it 100%. I was a very determined student (I left my whole country behind to study translation in London – lots at stake, you see! ), then a very determined business person (working against the odds) and I’ve always been striving to be a resourceful colleague. Don’t get me wrong, though. Giving it 100% is the only way forward, but it’s important to make sure you give 100% of yourself to the right thing. 2. The impression I personally have is that your day has way more than 24 hours – or that you are a superwoman who can do magic with the time you have. How do you do that? I’m no Hermione, I wish! I think it’s a mix of a couple of personal characteristics I’ve grown over time with careful business planning. I learned that time is the scarcest of all resources and I’m very disciplined by nature. Add some time-management tricks to this, like time boxing or backwards-planning and there you go, you’ll see that you can fit in more things than before. To be fair, I do have a virtual assistant and I can’t imagine running my business without her. I think I get some 3-4 extra hours a day thanks to her dedication and hard work. I can definitely recommend having a VA to any freelancer. You’ll see how much time you can save by outsourcing non-core tasks. 3. Break down a typical working day for us. Don’t judge me, but I do get up quite early. On a typical day in July, I’d get up around 4-4.30 and dedicate the first bit of the day to reading or studying. Then I go to the gym to be back before 8 am. I take about an hour to reply to emails and send proposals, do a bit of business development, prospecting, active marketing and reach out. I work from 9 to 4 or 5, depending on workload, with a lunch break in between. I often have meetings or events in the afternoon, so that requires a trip to central London. I use travel time to catch up with social media. If I don’t go anywhere, I spend this time blogging, writing, or doing other hobby-like bits. By the end of the day, I usually read or study. This year it’s Norwegian that’s keeping me busy at night. All in all, I do go to bed early. It’s been a going joke at conferences: I’m a very bad conversation partner after 10 pm. 4. What is the biggest challenge you face on a day-to-day basis running your own business? Finding balance. I think it’s extremely easy to go overboard as a freelancer and just work all the time. All work no play makes Marta… you know how the saying goes. Working 12, 14 or 16 hours a day should never be the norm, but it’s just all too tempting if you’re doing it for your own business. Saying no, saying stop, saying enough – this is the biggest challenge. 5. Besides your computer and the internet, what could you never, ever, in a million years run your business without?Purpose. There’ve been so many occasions where I’ve been that close to thinking that it would just be so much easier to find a job and let all worries and insecurities and problems go. But the feeling of purpose is what keeps me going. I know what I’m doing and why I’m doing it and I can’t imagine running my business without having a clear idea of my mission. Purpose is the thing that keeps you going though the hardships and you need it even more than wifi. I’ve always liked riddles, quizzes and puzzle. I learned English doing crosswords and reading Agatha Christie. My passion for problem solving in business made me do a whole degree in it (“to learn the causes of things”, that is). Enigma has always inspired me (not only because it was “solved” by a team of Polish mathematicians). Recently, I read a thought somewhere on Twitter that perfectly captured why I do what I do: translation is a problem-solving exercise. Every word, every phrase, every sentence gives me the chill of a puzzle, of a quiz or a problem that needs solving – here, now and only I can do it. Translation makes me feel a bit like a language detective, investigating all possible solutions, looking up traces in books and dictionaries, checking linguistic fingerprints here and there. And when the case is solved, the next one is right there on my desk. 7. As I have already said, you were and still are my role model in translation. You are a great inspiration! Now who has influenced you the most? Thank you, it really is an honour! Without the slightest doubt I can say that every colleague I’ve ever interacted with has left a mark. Every person has taught me something. But there are three role models in my life that have influenced me the most and really contributed to career-changing moments. I’ll let you guess based on short descriptions. First, it’s my lecturer from my BA degree who has taught me the basics of professional translation and also – maybe even more importantly – humbleness when working with language. Second, it’s someone I’ve been working closely with and who actually came up with the idea of creating the Business School for Translators course. It was – and still is – one of the best things I’ve done in my life and I wouldn’t be here without this person’s contribution. Third – don’t laugh – is a translation scholar. I’ve been really influenced by her books and research and I wish I can meet her in person one day. She’s a German translator and in 2008, she’s been named Profesora Honoraria da Facultade de Filoloxía e Tradución, Universidade de Vigo. You have all the tips you need to find out who they are! 8. Lastly, nominate an amazing woman in translation who you think should beinterviewed in our series. Now, this is a puzzle to solve for you, Caroline! I nominate woman number 2 from my previous answer. I got two of them wrong and one right. Marta gave the fun idea of letting you guess as well. Do you have any idea who her role models are and who she nominates as the next interviewee (I’ve already talked to the person and s/he accepted it)? Let the guesses begin. Marta has also written a guest post for us a while ago: Freelance translator as a sole breadwinner: opportunities and challenges. Here’s the link to the second interview. « Who run the world? Girls! “Translation is a problem-solving exercise. Every word, every phrase, every sentence gives me the chill of a puzzle, of a quiz or a problem that needs solving” — I can definitely relate to this, and I’m sure many other translators will. I also loved that part, Christelle! Christelle, do you have any idea who Marta’s role models are? Or at least who she nominates as the next interviewee? You can say the name, Christelle. Ooh, it’s on the tip of my tongue… Will have to get back to you! Great interview!! Nice way to star the series, Carol! “Purpose is the thing that keeps you going though the hardships and you need it even more than wifi.” Just loved it! I’m glad you liked the series and our first interview, Graziele! Thanks for visiting and for the feedback! Any ideas who her role models are? Or at least who she nominates as the next interviewee? As expected, an inspiring interview. Marta, thanks for sharing these bits about you and your business and I could not agree more with the fact that translation is like a problem or puzzle-solving exercise. That’s why I love it too. Tell us who you think the next interviewee will be, Alina! As always, thanks for visiting and leaving a comment! As for Marta, I had the pleasure to meet her in person and she’s genuinely a wonderful woman, very warm, kind and very, very lovely. I look forward to meeting her in person at the IAPTI conference this September. Thanks for dropping by, Alina! Yes, you guessed right 🙂 Who do you think the second person is? I loved the interview! Thank you so much for inviting Marta, Caroline! And Marta, I can’t thank you enough for sharing some of your knowledge with us! “Time is the scarcest of all resources” – I couldn’t agree more! And of course, translation really is a problem-solving exercise! That’s why it’s so rich and interesting! Thank you so much for visiting, as always, and for leaving your kind words! Much appreciated, my dear. I loved the interview and I loved her vlog too. Congratulations!! !